I love free market innovation. Wal-Mart has applied for a U.S. patent for a floating warehouse that could make deliveries via drones, which would bring products from the aircraft down to shoppers’ homes. 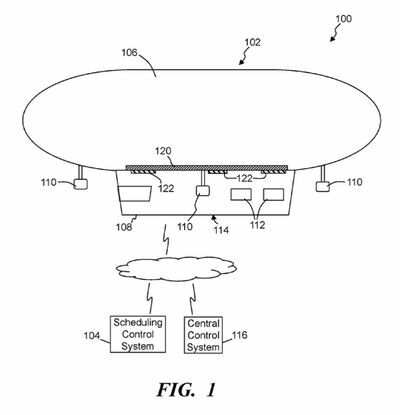 The blimp-style machine would fly at heights between 500 feet and 1,000 feet (as much as 305 meters), contain multiple launching bays, and be operated autonomously or by a remote human pilot. Ha! I've always been a little bit of a problem child from time to time. Is it a tax thing, that would drive this? That's a lot of product to crash to the ground. Hmmmm.. Tax district air space. Lots of room for legal mischief here. Can we monetize it? GoFundMe anyone? There's nothing free market about seeking a patent. Robert feels IP is like property which should be protected even when there nothing to stop YOU or ME from building a gawd-damned dirigible. What year is it? This is the sort of stuff I would read about in early 20th century publications. With so many ideas like this being very old they will probably have some rather narrow claims once its granted if at all.